As British Military Assistant Training Team (BMAT) completed the six weeks intensive training for men of Nigerian Air Force (NAF) that protect air assets in the country, NAF on Friday took delivery of five multi-task digital aircraft to enhance training of pilots. The aircraft with brand name, Super Mashshak from Pakistan according to Chief of Air Staff, Air Mashal Sadique Abubakar was designed purposely for Nigerian use quickly added that, additional five will be added before the year runs out. CAS, who was in Kaduna as special guest of honour at the graduation ceremony of Basic Regiment Airmen course 23/2017 and Force Protection in Complex Air Ground Environment hinted that, the aircraft when coupled will be put to use primarily for training and as surveillance, ambulance among other task due to its digital nature. “The aircraft is going to be for training of pilots. The regiment you saw have been trained to take care of critical air assets across NAF bases and airports. You need to train all the pilots that will pilot planes even in the Northeast and other part of the country”, he said. On the passing out ceremony Air Chief Sadique described the event as another milestone in NAF quest to build a highly professional and disciplined force that will give impetus to an effective and efficient response by the Nigerian Air Force to country’s security challenges. He said, “as these challenges continue to transform in form and scope, the need to give more priority to human capacity development, cannot be over emphasised. Our engagement in different theatres of operation, and the need to protect the limited resources available to undertake our statutory responsibilities of projecting air power underscores the need to continually develop force protection capability of the Service”, he said. To the graduating personnel he said, ” the training you have received on Force Protection in Complex Air Ground Environment will require you to speedily gain capacity to enable the Service to locally develop and sustain additional workforce in this field of specialization. 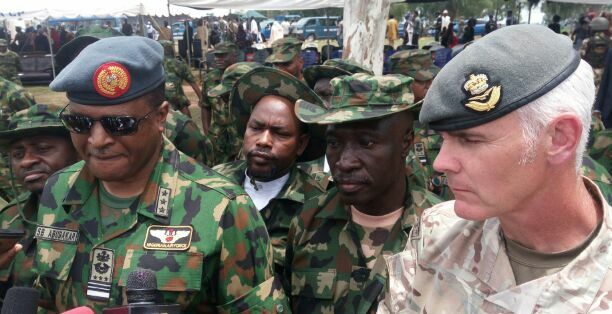 Let me extend my special gratitude and appreciation on behalf of officers, airmen/airwomen of the NAF to the British Government, for its continued support towards capacity building of our men/women through the BMATT program. “I am optimistic that the skill acquired from this training has made you graduands better prepared for the tasks ahead. Let me, however, add that while the Service can provide the means for training and mentoring, the ultimate resolve to optimize the gains of your training, in ways that add value to society, is a personal one. “I therefore, charge you all to justify the confidence reposed in you by the NAF and indeed the Nation, by rededicating yourselves for excellence in the discharge of your duties. Our social contract with the Nigerian people is one we cannot afford to take for granted, especially now that much more responsibilities are vested in us. “As such, our actions must at all times be guided by the respect for the rule of law and the rights and dignity of our citizens. On the part of the Service, we will continue to provide the required resources and conducive environment for you to discharge your duties effectively”. He then thanked President Mohammadu Buhari for giving the NAF enabling environment to operate just as he commended the Commandant, Regiment Training Centre and his team of instructors for their effort. “The Nigerian Air Force remains ever dedicated to the defence of our territorial integrity and sovereignty”, he concluded.